Last Thursday marked our official Nomad Works Relaunch Event. 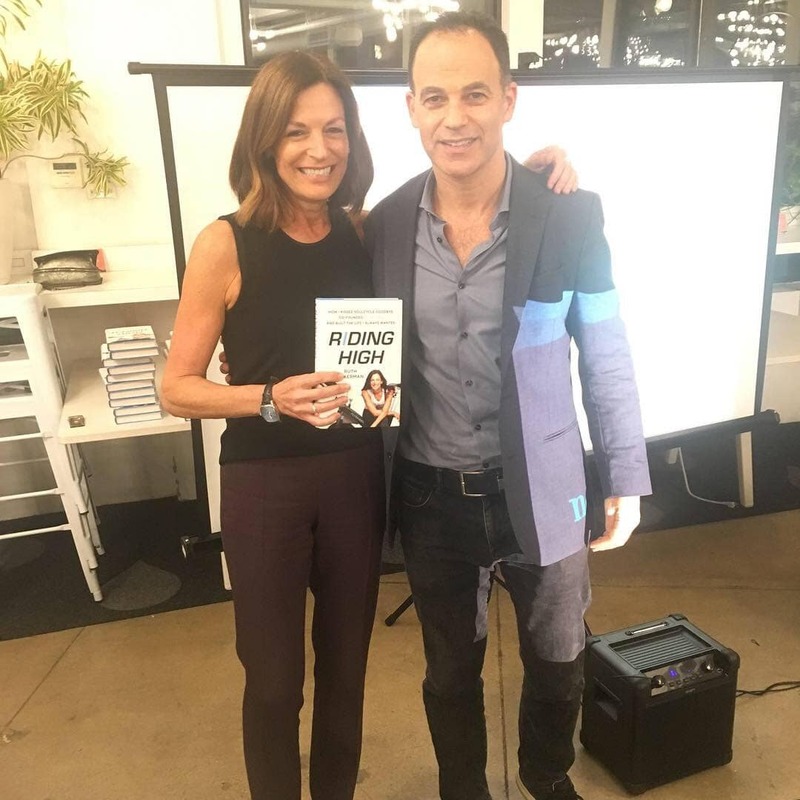 We were very proud to host Ruth Zukerman, co-founder of Flywheel & Soulcycle, as she discussed her journey, career, and new book Riding High. The talk was moderated by our CEO Steven Cohen. Such a big occasion had to be coupled with a great speaker and we couldn’t have picked a better one to headline our event. Ruth, a New York native, had humble beginnings as a professional dancer in New York City. 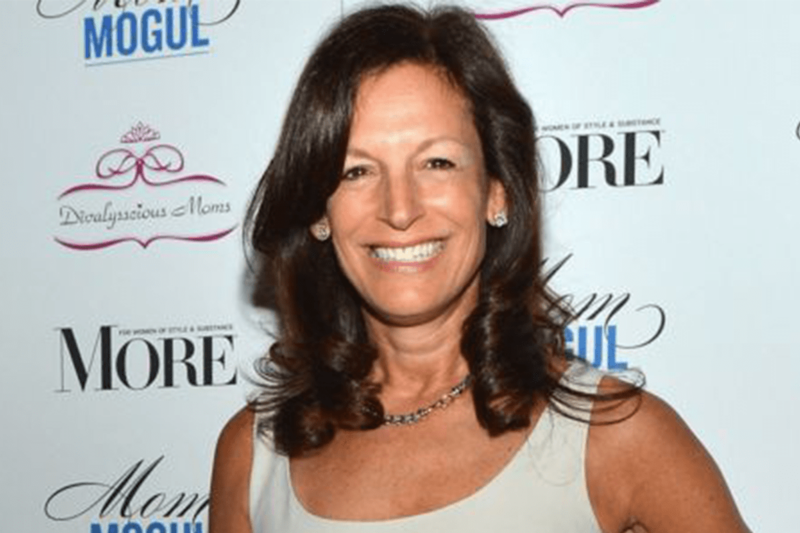 She shifted gears and began teaching aerobics in Manhattan’s Upper West Side. It was there her vision of Soulcycle began to emerge. Ruth wanted to focus on the mental and spiritual aspects of spin classes. In 2006, Soulcycle was born. Ruth would eventually walk away from Soulcycle, and found yet another spin-class studio, Flywheel, in 2010. There aren’t many cases of two industry leaders being born from the same brain, but that just speaks to how brilliant Ruth truly is. Ruth spoke about how hard it was to not only achieve your dream, but have to work away from it to start again, and the importance of never compromising your character. 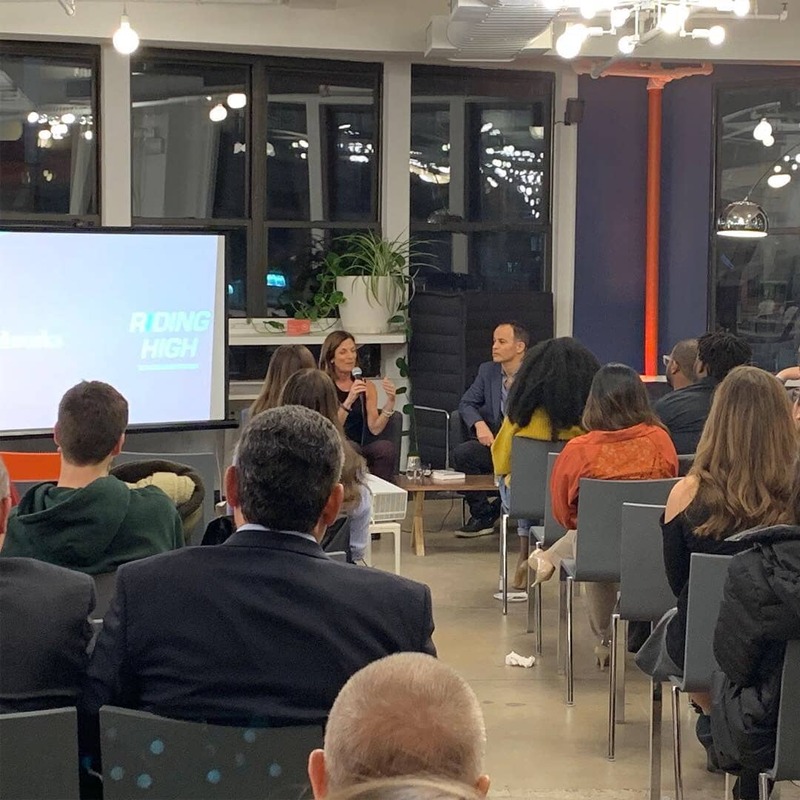 Ruth captivated our audience with her resiliency, speaking of the difficulties of being a mother, running a company, and making the right decisions. She spoke of setbacks and hardships, but the main takeaway from her talk was her enormous amount of hope and positivity. After the Q & A session had concluded, Ruth stayed to chat and take photos with the Nomadworks community. We want to thank Ruth for her time, and would welcome her back to our space with open arms! Thank you for a wonderful evening. Oh, and by the way, she even provided every guest of the event with a free signed copy of her book, Riding High, on sale now. All great events need to have great food, and that’s why we want to also give a big thanks to Bareburger for catering the evening. They even gave us a sneak peek at some special catering menu items that you may not expect from the iconic burger chain. What you could always expect from them, however, is mouth-watering, delicious chow! 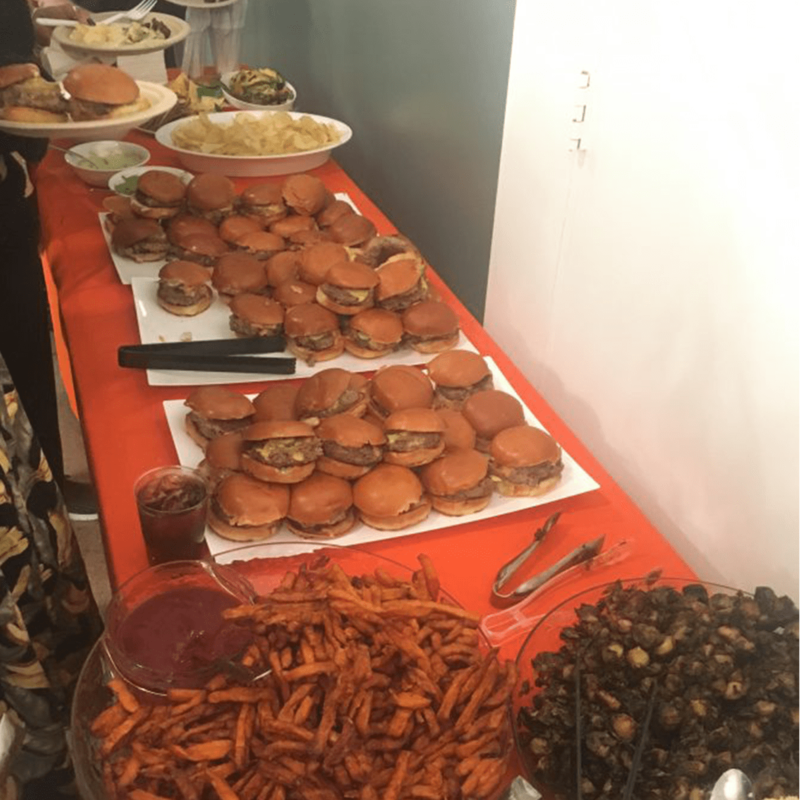 Impossible Burgers, Sweet Potato Fries, and Brussel Sprouts provided by Bareburger. Our Relaunch as Nomadworks is now fully official and we couldn’t be more excited. What can you expect from us? Well, it goes without saying we will be upping the ante on what “premium” coworking means here in New York City. With Nomadworks, you aren’t just getting a desk, or an office space, you are getting a membership to a community of bright, hungry, forward-thinking people taking their industry by storm. We are committed to providing our members with thought-provoking, exciting events, to establish ourselves as a hub of innovation. Our mission as Nomadworks is to provide a space with an inclusive nature for all to flourish, a flexible design to help every business no matter the size succeed, and of course, helping you find that Nomadic Spirit. What does that mean to you? Well, you’re just going to have to come join us to find out. It’s time to leave the grind behind.